NDP Leader Tom Mulcair speaks on EI in Moncton this morning. We're going to protect EI premiums so that they pay for EI benefits and they aren't treated as the government's piggy bank. 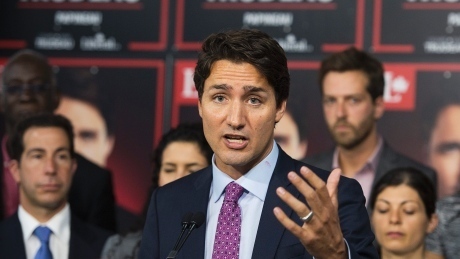 Liberal Leader Justin Trudeau brought his campaign to Montreal today announcing that a Liberal government would invest a total of $380 million in new money into the country's cultural and creative industries. 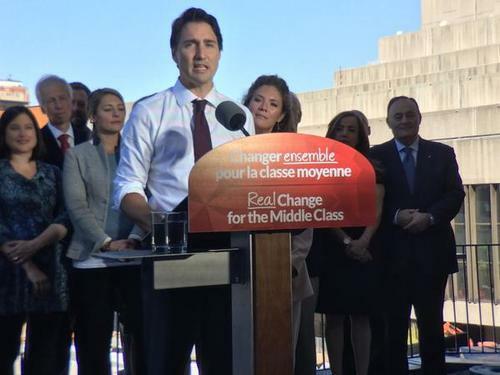 Trudeau spoke to supporters and members of the Quebec arts community in downtown Montreal. 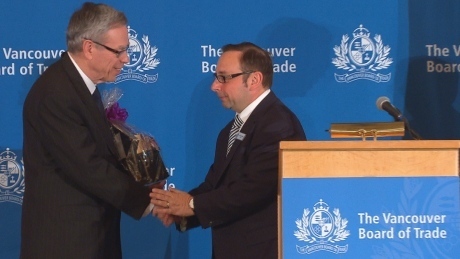 He was introduced by his wife, Sophie Gregoire, a former broadcaster and television host. He said that culture and creative industries generate jobs in Canada but the government needs to reinvest in the industry. Double the investment for the Canada Council for the Arts to $360 million a year from $180 million. Restore the Promart and Trade routes international cultural promotion programs that the Conservative government has cut. Increase funding for Telefilm Canada and the National Film Board. Increase funding for the Young Canada Works program to help young people prepare to work in the heritage sector. ​This is part of the Liberals​ investment in social infrastructure of nearly $6 billion over the next four years. It really is a natural extension of political party as brand.... The cliched picture of the leader serving coffee at Tim's is the best example of this: it communicates a ideal of everyman. 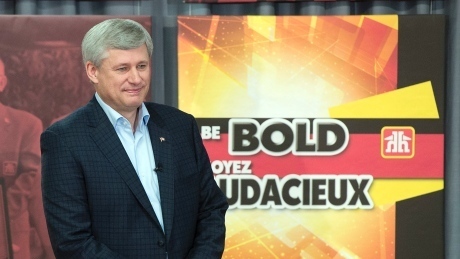 Are election backdrops a new form of corporate political donation? 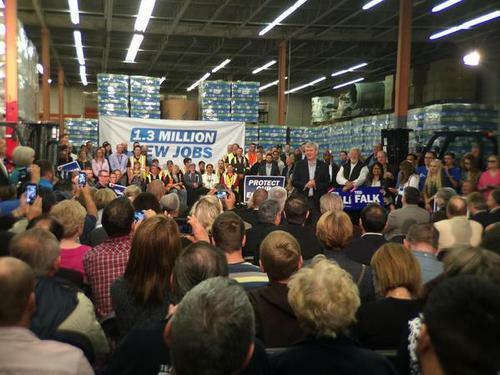 On Monday, as Conservative Leader Stephen Harper spoke about his party's plan to encourage home ownership, a massive Home Hardware logo loomed behind him. But Elections Canada doesn't see that free advertising as a campaign expense. 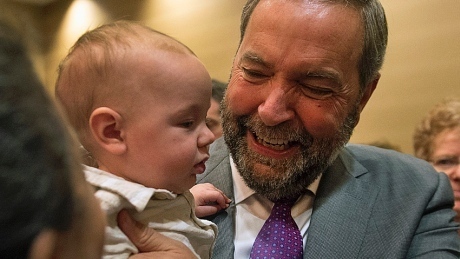 Spin Cycle: How viable is the NDP's national child-care plan? The NDP's Tom Mulcair has been touting his party's $15-a-day national child-care plan at almost every campaign stop. But it could take two NDP terms and a bunch of provincial changes-of-heart to make it happen. 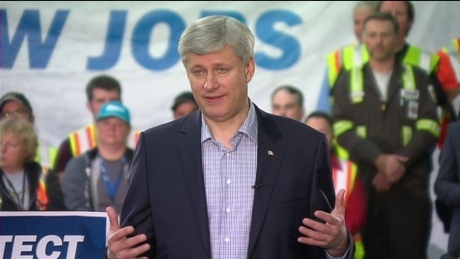 Conservative Leader Stephen Harper on how long he'll serve. 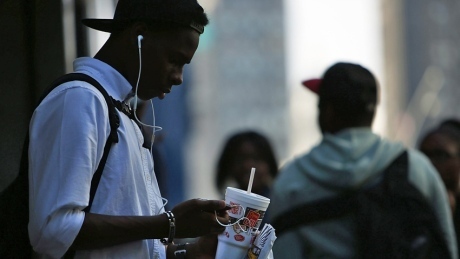 ​The Canadian Diabetes Association is calling on federal leaders to support and eventually introduce a tax on sugary drinks. Phil Authier of the Montreal Gazette joins host Éric Grenier to talk about the controversy around the publishing of an NDP-commissioned poll in Justin Trudeau's Papineau riding. 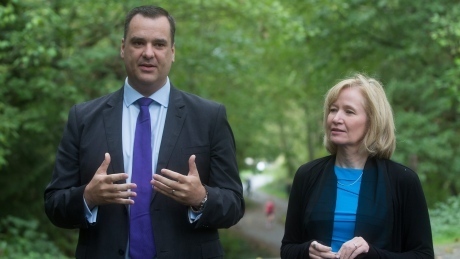 Conservative James Moore's claim that the family of Terry Fox supported his party's plan to match donations raised during the annual Terry Fox Run was met with criticism online after the family issue a statement refuting the claim. 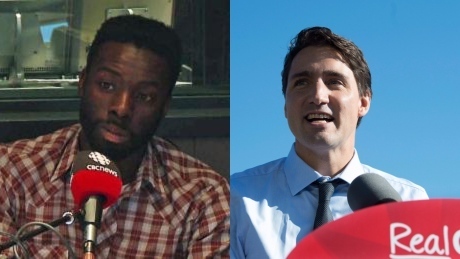 Justin Trudeau made a 'careless nod to anti-black stereotypes' Monday night while discussing the topic of violence against women, claims Toronto journalist Desmond Cole, who took to Twitter to discuss the issue.